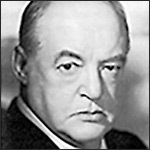 Sydney Greenstreet masterfully portrays Nero Wolfe, the armchair detective extraordinaire created by Rex Stout. This eccentric private detective is an orchid fancier and connoisseur of gourmet foods. He’s "the balkiest, bulkiest, smartest, most unpredictable detective in the world!" Ever in search of his custom made chair and a cold bottle of beer, Wolfe often sends Archie Goodwin (his secretary and operative) to do the leg work when clients come calling. Archie follows up on leads, lavishes attention on the ladies involved, and sets up his brilliant boss to solve the case. Description: "The original and immortal stories of Sir Arthur Conan Doyle…"